The two main spas closest to the Southern shores of Lake Balaton are at Héviz and at Zalakaros. 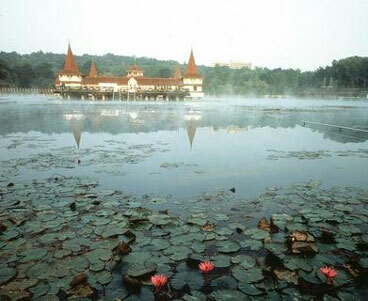 Héviz is the largest natural, medicinal thermal water lake in the world. The lake is situated amidst woodland and filled with flowering lilies in late Summer. Due to the mixing of hot and cold water welling up underneath Lake Héviz, the temperature of the water varies between 33-35 degrees C in Summer and 26-28 degrees C in Winter. Inactive stages of chronic degenerative diseases of the bones and joints. Inactive stages of chronic inflammatory locomotor disease(e.g. rheumatoid arthritis, arthritis, Bechterew's disease). After-care following operations on the bones and joints. Zalakaros Medicinal Baths are situated not far from the South-Western end of Lake Balaton. The baths are open throughout the year, however the outdoor section is only open during the warmer months. General mental and physical exhaustion.